CMS Proposes Payment Changes for Medicare HHAs for 2019 – The Health Law Offices of Anthony C. Vitale, P.A. The Centers for Medicare & Medicaid Services (CMS) is soliciting comments on a proposed rule that will impact payment and policy for home health agencies and home infusion therapy suppliers. The proposed rule is an update to the Medicare home health prospective payment system rates for calendar year 2019, as well as a broader case-mix methodology reform proposal that would be implemented the following year. The proposed rule also discusses the implementation of temporary transitional payments for home infusion therapy services to begin on Jan. 1, 2019 and includes proposals related to full implementation of the new home infusion therapy benefit in calendar year 2021. CMS notes the proposed rule is designed to empower patients, increase competition and foster innovation, while at the same time reducing administrative burdens associated with the existing model. Based on the proposed policies, CMS projects that Medicare payments to home health agencies in 2019 would be increased by 2.1 percent, or $400 million. The proposed increase reflects the effects of a 2.1 percent home health payment update percentage ($400 million increase); a 0.1 percent increase in payments due to decreasing the fixed-dollar-loss ratio in order to pay no more than 2.5 percent of total payments as outlier payments (a $20 million increase); and a -0.1 percent decrease in payments due to the new rural add-on policy mandated by the Bipartisan Budget Act of 2018 for 2019 ($20 million decrease). The new rural add-on policy requires CMS to classify rural counties into one of three categories based on: 1) high home health utilization 2) low population density and 3) all others. Rural add-on payments for CYs 2019 through 2022 vary based on counties’ category classification. The Patient-Driven Groupings Model (PDGM) is proposed to begin on or after Jan. 1, 2020. The proposal, that would change the home health unit of payment from 60 to 30 days, was previously proposed but not finalized in order to allow CMS additional time to consider public comments for potential refinements. The move from 60 to 30 days is designed to reflect CMS’ focus on relying more heavily on clinical characteristics and other patient information to allow payments to more closely coincide with patients’ needs. “The improved structure of this proposed case-mix system would move Medicare toward a more value-based payment system that puts the unique care needs of the patient first, while also reducing the administrative burden associated with the HH PPS,” according to CMS. In what CMS has said is an effort to “foster innovation,” the agency is proposing to define remote patient monitoring in regulation for the Medicare home health benefit and to include the cost of remote patient monitoring as an allowable cost on the home health agency cost report. “CMS believes that by defining remote patient monitoring and including such costs as allowable costs on the HHA cost report could encourage more HHAs to adopt the technology,” the agency stated. With regard to home infusion, CMS is proposing the implementation of the temporary transitional payment for home infusion therapy services that would begin on Jan. 1, 2019 and end the day before the full implementation of the new home infusion therapy benefit. The 21st Century Cures Act creates a new separate Medicare benefit category for coverage of home infusion therapy services, including associated professional services for administering certain drugs and biologicals through a durable medical infusion pump, training and education, and remote monitoring and monitoring services effective Jan. 1, 2021. This rule solicits comments on elements of the home infusion therapy benefit. In addition, this rule also proposes health and safety standards for home infusion therapy, an accreditation process for home infusion therapy suppliers and an approval and oversight process for the organizations that accredit home infusion therapy suppliers. CMS will be accepting comments through Aug. 31. 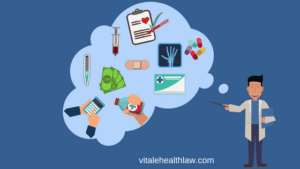 The Health Law Offices of Anthony C. Vitale can help you better understand any changes coming down the road. If you have any questions contact us at 305-358-4500 or send us an email to info@vitalehealthlaw.com.